The Tampa Bay Buccaneers had a very busy offseason leading up to the 2018 NFL Draft, as they were one of a few teams with a bevy of money to spend within the salary cap. After locking up veteran CB Brent Grimes to a one-year extension, Tampa traded for edge defender Jason Pierre-Paul, signed edge defender Vinny Curry, interior defender Beau Allen and interior defender Mitch Unrein all on defense. After an offseason spent accruing weapons for Jameis Winston and the offense in 2017, this year’s offseason was largely spent improving their defense. However, Tampa also did their best to bring in problem area solutions, signing Ryan Jensen from Baltimore to man the center of the offensive line, allowing Ali Marpet to slide back over to guard after a seemingly failed experiment with him at center. While Marpet didn’t play bad at center last season, his best years have been at guard and the move to bring in Jensen frees him up to move back. TE Cameron Brate was brought back, as was WR Adam Humphries and QB Ryan Fitzpatrick to backup Winston as the offense will look relatively similar to last years. 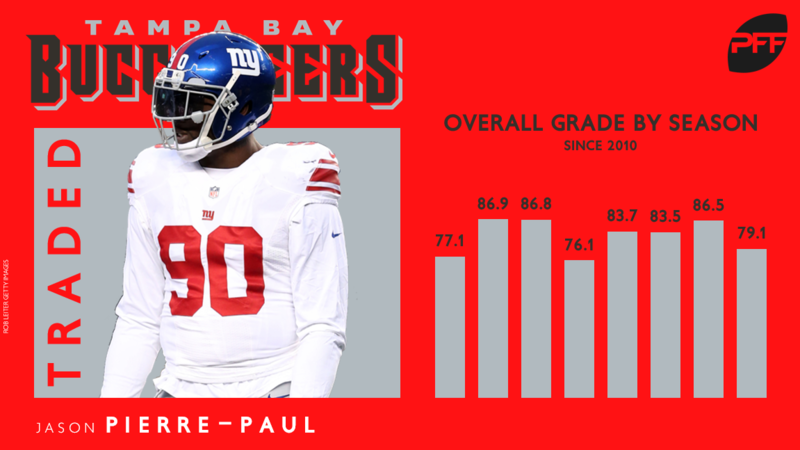 With their movement to improve their defense and also the acquisitions on the offensive front, what do PFF Senior Analysts Steve Palazzolo and Sam Monson think of their offseason so far?